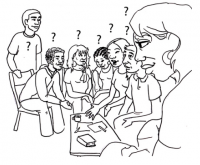 Talking about class can be difficult – especially in intentional communities that include people from a variety of backgrounds. It can be a challenge to balance the needs of members from different classes: residents with stable jobs and incomes; property owners; activists who choose to live frugally; those with families to support. Some concerns – like the fear of losing housing – may feel more immediate to those who have experienced housing instability in childhood. Those from a middle-class background may be more comfortable navigating written contracts – or making community decisions over e-mail – than those whose class culture relies on verbal agreements. Acknowledging these differences in life experience and communication styles can go a long way toward making sure that everyone in a group is heard and included. The video below explores one of those topics – vocabulary differences between classes. You can learn more about all four of these groups in the Activist Class Cultures Kit, available for free on the Activist Class Cultures website. Hopefully this toolkit will give you some ideas for talking about class within your community. 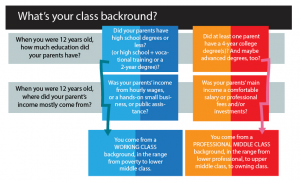 Check out these infographics to explore your own class path, or take this quiz on class culture traits. Post your own experiences exploring class in your community in the comments below! ← Social Permaculture—What Is It?